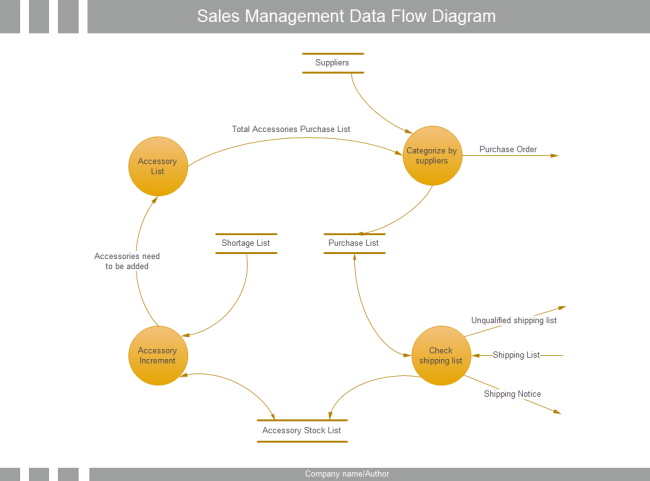 See how a data flow diagram displays the flow of data in an order processing system, and learn to use data flow to document business process. What's a data flow diagram? 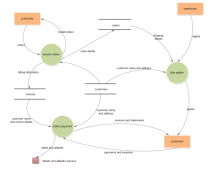 Data Flow Diagram is a data driven architecture for depicting the flow of data of a system. You can see a visualization of where data comes from and where it goes. 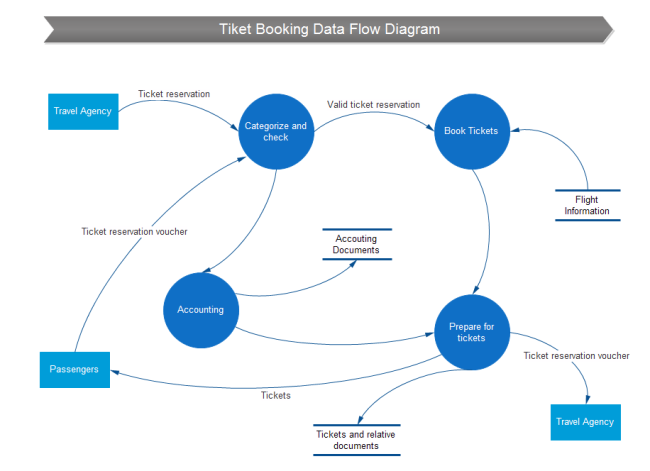 Data flow diagram is composed of data process, state (start state, stop state), data store, external entity, and flow. 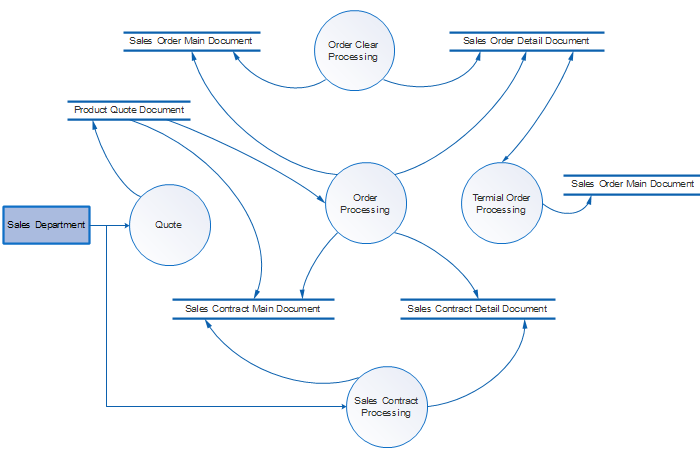 How to make an order processing system data flow diagram? A few things need to be done before drawing the order processing system DFD. Gather the information that enters the system and leaves the system. Identify what information or data has stored in the system. Identify what processes need to be included in the system. People or entities who generate or receive the information. After all the information has organized, it's time to use correct symbols to represent the information. Circle represents processes, which take data as input, do something to it, and output it. Arrows represents the data flows, which can either be electronic data or physical items. Two bold parallel lines represent the data store, a place for storing information within the system. Rectangle square represents external entities. Why Edraw Data Flow Software is Well-received by Users? All the shapes required in a data flow diagram could be found in Edraw data flow symbol library. Nothing new needs to be drawn. The shapes are highly editable. If you don't like the default size or color, you can change them easily. Edraw data flow program is design with a user-friendly drag and drop function. Drawing couldn't be easier. Easy interface provides a great convenience for novices. It uses the same interface structure with Microsoft program, which means as long as you can use a Word, you can use our program. The software has included dozens of templates that you can modify and use. 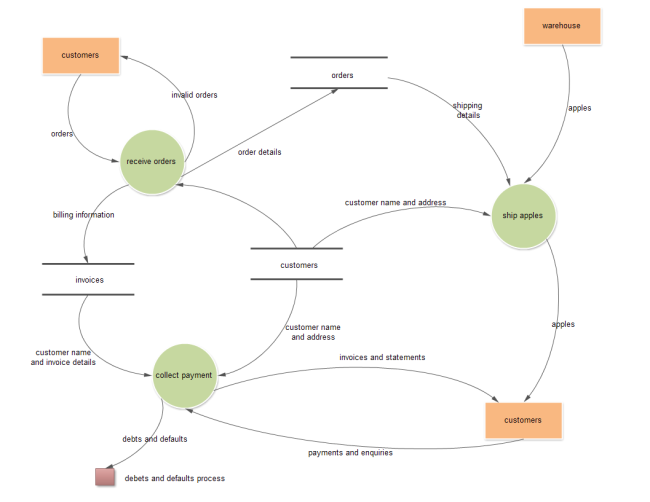 They will not only let you go quickly but lead you to create presentation-quality data flow diagrams. Here are some examples showing brilliant works done by Edraw data flow software. The examples are downloadable, but you need to install an Edraw viewer to view them, or install Edraw Software to edit.